Seeing Leeds United losing both of their goalkeepers Jamal Blackman and then Bailey Peacock-Farrell to injury just goes to show how fragile squads can be. Marcelo Bielsa has admitted he was going to play Blackman instead of Peacock-Farrell against Bristol City and while that doesn’t tempt fate as such, these things happen. You only have to look at what happened with Patrick Bamford behind closed doors when he injured his posterior cruciate ligament playing for the under-23s – sidelining him for four months. You have got to keep the goalies ticking over, especially the ones that aren’t playing but it’s just sheer bad luck I think. 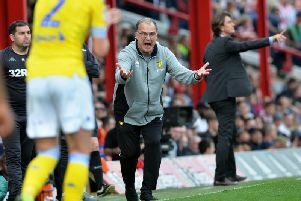 Now you have to see how the injuries go but if you have said the things that Bielsa has about Peacock-Farrell and then immediately you need them to play and play well for you, then that’s a delicate balancing act, especially for a young lad. If you look at the West Brom game for example and the second goal then yes Bailey could have done better. But these things happen to a goalkeeper and it’s all character building. It’s an odd situation that I have not been involved in and when you look at it and how well Bielsa has done so far to manage injuries, they were all outfield players. And if Leeds can’t get an emergency loan goalkeeper in and you have got to blood a young player like Will Huffer or Kamil Mizaek then there will be a lot of focus on that and a lot of pressure. But hopefully, if you look at it from a positive point view, it could make someone’s career if either of them come in and do well. But in the long term Bailey can definitely learn and build from this and become a better player for it. Every player has got to take it on the chin when the manager feels that they are not doing their job. Only the very, very best can play every single game, every single season and I think you have got to look at the relative age of Bailey as well. He’s still only 22. We always look at goalkeepers as the more experienced players and it’s re-assuring to have an older head in between the sticks. But with the way things have panned out for Leeds, it’s been Bailey and at the back end of last season he came into the side and he did fantastically well. From that point of view, it’s a test and a test of his mental strength and character because I always thought that when you did make a change of goalkeeper it is a big change. In the make up and fabric of a side, players such as me relied on the fact that when you made a change in midfield or in defence, that change was part of a unit. That’s the manager changing it and he might be saying ‘it’s specifically you’ or he can look at it slightly differently in terms of a change of formation or different players playing together. But while I know they are part of a back five, with a goalkeeper it’s just you and the finger is solely pointed – as in ‘the reason I am changing this is because I don’t think you have been very good’ and that’s a part of football which you have to learn to deal with. The current injury situation has obviously raised questions over whether Leeds need to invest in January and when Marcelo Bielsa says that he won’t need to bring new players in, I don’t know why he would say that. Maybe he is saying that to subconsciously reassure the lads he has already got. But if you have the chance to buy in January and the money is there and you look at the injuries, then to just dismiss that out of hand, I can understand why some fans might find that slightly odd because it just doesn’t make sense. I am not saying you have got wholesale bulk-buy people in because it can upset the equilibrium of a squad. But I think especially in this instance when you have got to keep half an eye on the team not running out of legs and not dying away at the end of the season then you have got to look at it. The one thing we have always said over the course of the season and the most impressive thing is how Marcelo has managed to get more out of the same players which is a true sign of someone who knows how to coach and motivate and how to put a team together. But I think reinforcements in January are needed for a promotion push because as we have seen this week, you have got to be prepared for the worst.